Snoop Dogg at Loyal Studios. Snoop has produced multiple projects with Loyal Studios and is a big supporter of the effort to keep production in California. (Burbank, CA) Producer Bob Bekian –who owns Loyal Studios in Burbank and Santa Monica– has been bringing together California production people with a series of events to showcase new high definition technology, and stimulate production in the state. The first event was co- sponsored by Band Pro, SONY, Edgewise Media, and Bekian’s rental companies Pro HD Rentals.com and Loyal Studios. Featuring over $3 Million worth of the latest cameras, cranes, and lenses, the event showcased live demonstrations of the SONY F65 camera system –which offers incredible resolution and is widely used on feature films and television. Over 300 industry professionals attended and were introduced to the latest technology while networking with each other. 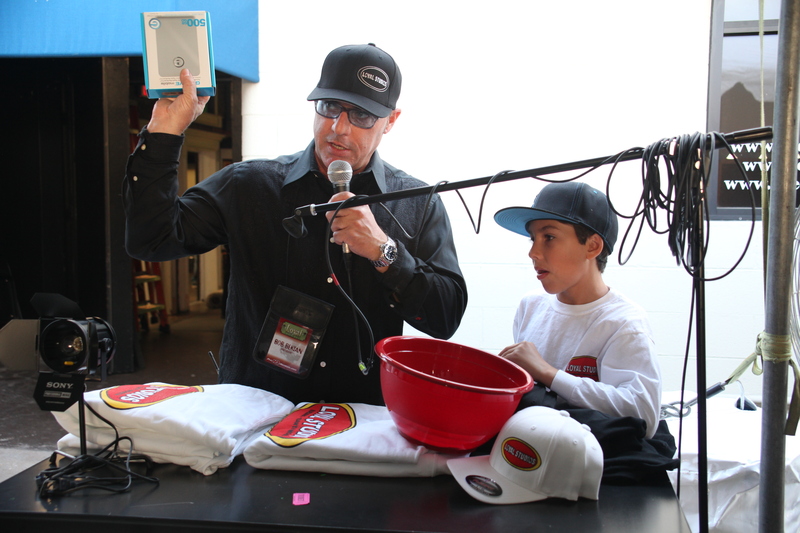 Loyal Studios President Bob Bekian and his son Bryce giving away prizes at One of Bekian’s industry events. Bekian has developed what he calls a “one stop production shop” which incorporates his pre-lit studios, 75 HD cameras, top technical people with an in-house control room and edit suite. Johnny Depp at Loyal Studios in Burbank California. Bekian is continuing to put together events in his studios, with the next one sponsored by Canon and featuring the new Canon cinema cameras and lenses including the C-500 model. Bekian’s Loyal Studios have been a favorite of A-List celebrities including The Black Eyed Peas, Gerard Butler, Don Cheadle, Guillermo Del Toro, Johnny Depp, and Snoop Dogg.